Christmas is right around the corner. Is your tree up yet?Is the bottom of the tree naked? 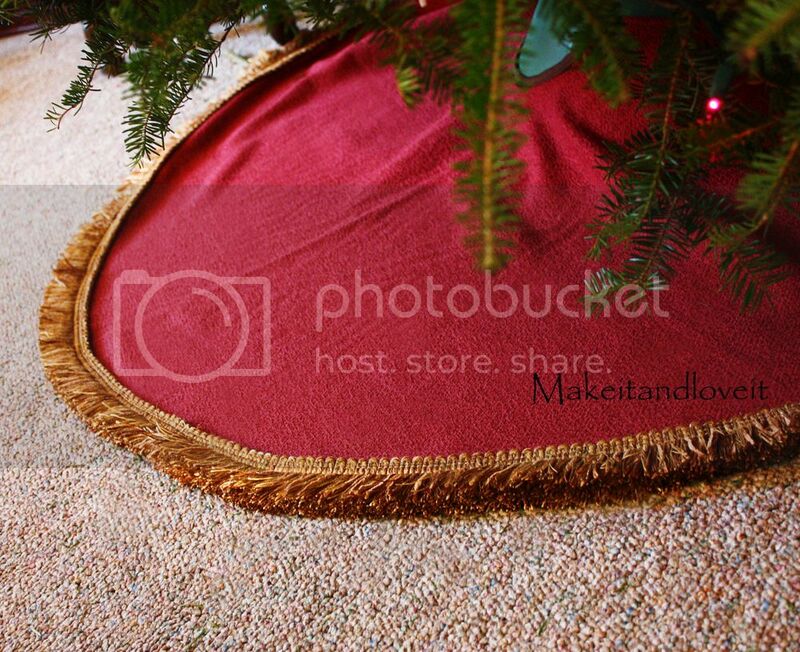 A very basic, yet classy tree skirt. I have had several requests on how to make one……so here is a very simple solution. You’re going to love how easy this is. And how many ways you can personalize it and make it your own. I stopped by Hancock Fabric and checked out their clearanced upholstery fabrics…..and found a Christmas-y color. This fabric was 60 inches wide and I bought 2 yards for a couple of dollars. And this made a good sized tree skirt. Probably perfect for a 6-7 foot tree. Anything larger, and you would need to piece fabric together to make it bigger. Then I found upholstery/curtain trimming on sale for 80% off. So it ended up being about $1.25 a yard. I used about 4 yards. …..and then cut around the bowl. Then fold the edges of the two straight edges under a 1/4 inch and then another 1/4 inch. Sew into place. Then turn under the edges of the outer circle a 1/4 inch and then another 1/4 inch. Sew into place. Then attach your trimming to the outer circle. And that’s it. It's beautiful! No one will ever know it was so easy to make. Girl, you are prolific with your sewing! Your blog is wonderful and inspiring and I've noticed that some of my blog readers have you on their blog lists now too. This turned out really great. I will keep it on the back burner for someday when we have a home big enough for a normal size tree! This is perfect! Thanks so much for this, I'll be linking. My three year old called this the "Christmas Tree's Blanket. So it won't get cold." Great tutorial, I found this so easy to follow I had to have a go. Please take a look and let me know what you think. I still have to add my trim as I am unsure how to put it on at the moment. If you want to skip a step, if you are hot gluing down the border trim, you don’t even have to sew the edges. The trim goes right over it, easy breezy!!! Thanks so much for this great tutorial! I used it as a starting point for my tree skirt! So funny that I keep running into your blog! I was in your ward at BYUI. Love your talent! Thanks for sharing. Oh my gosh I have been looking for a simple Tree Skirt tutorial since last Christmas… thank you so much for this I can’t wait to make one!